There’s no doubt about it, the kitchen is an important part of any property. It’s where we go to fuel our minds, bodies and souls with tantalising dishes and laughter when inviting friends around for dinner. The size of a kitchen is likely to be a big determining factor in how frequently the heart of a home is used, but that’s not to say that a small kitchen can’t be utilised. All that’s needed to create the perfect kitchen is some clever design, space planning and thoughts about how you can cook up a storm while simultaneously spending time with your loved ones. Determining how easy it is for you to currently move between appliances and utensils will help you to figure out whether you need to redesign the layout of your kitchen. Similarly, an inclusive kitchen with low worktops may be a necessity for you, whereas your current room doesn’t allow for such mobility. This could be solved simply by ridding yourself of unnecessary items and relocating the ones that remain so that they are easier to access. However, if you find that you’re still in need of more space, looking for alternative places to store items may be the solution for you. For instance, deep drawers are ideal to see everything from above as opposed to rifling to the back of a cupboard. Likewise, open plan shelving and hanging large utensils are a great way to optimise space and create the aesthetic that you are hoping for. Picking a palette is arguably one of the best ways you can create the kitchen of your dreams as different hues will allow you to adhere to various design options. For instance, a sleek and glossy white and black interior will enable a modern aesthetic whereas pastel colours on wooden cupboards are ideal for a traditional country style. There are a number of ways to transform your kitchen into the heart of your home, one of which is considering how you can entertain yourself and others while in there. Having a TV on the wall or fridge will keep you entertained while cooking, or enable you to cook along with culinary programmes. You could also incorporate a wine fridge or rack for when you’re entertaining guests. Creating a kitchen of your dreams means transforming a space so that it fits your personal tastes and needs. 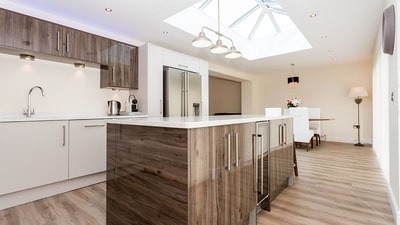 Opting for a bespoke service that will enable you to decide how you want your room to look and operate is without a doubt the key to creating the perfect kitchen. So if you’d like more information about how we can help you install and create a dream room, please don’t hesitate to get in touch with us for a quick quote. Make sure you also keep an eye out for our upcoming blog posts about interior design trends and tips by following us on Facebook and Twitter!